Now that the cold, wet dreariness of winter is in our rearview mirrors, it is time to rejoice in the “summery” outdoors. But what do you do if you’ve gotten so used to spending your days cooped up inside that you’ve forgotten how to take advantage of your backyard? The answer is simple: bring the indoors out! With a few DIY tricks, you can spend your summer indulging (comfortably and with style) in everything the outdoors has to offer. If what you love most about your living room is the enormous cozy couch that also takes on the role of the perfect setting for reading, don’t hesitate to bring it outside. Not literally of course, but today there are endless options for patio furniture, plenty of which solely focus on comfort. The best news: you don’t have to sacrifice style either. It is advised to get creative when it comes time to choosing fabrics and a color pallet. If your interior puts off a neutral, serene vibe, consider adding a pop of color to your backyard. Just be sure that whatever accent color you choose compliments your interior pallet. Nothing says summer like hues of blue and yellow. After all, you should be craving something brighter after enduring many months of gray. The biggest mistake people make when preparing their backyards for summer is getting stuck in the mindset that inside and outside are completely different. While they might technically be opposites, when it comes to home design, they should be considered one in the same. 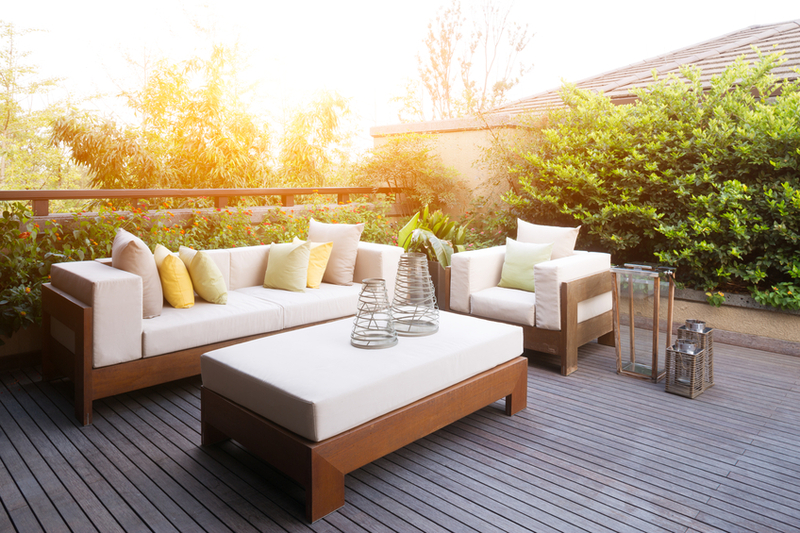 Things like pillows, rugs, blankets, and mirrors are usually thought to be indoor accessories, but who says you can’t create a desirable outdoor living space using these items? There are a number of weatherproof rugs that can spruce up an outdoor dining area. Not only will they add a touch of formality, the right rug will act as a comfy resting spot for you and your guest’s bare feet; the same goes for pillows! The last thing you want in your backyard is an uncomfortable seating area, so use a few fun throw pillows to upgrade your space. When you really think about it, the only thing that differentiates the indoors from the outdoors is a roof. If you’re worried about getting sunburned this summer - or you are someone that prefers reading or enjoying that morning cup of coffee under some shade - it might be time to consider a pergola, gazebo or large umbrella. Purchase a cheap pergola at your local hardware store, or find a DIY option online (all you’ll need is a few 2 x 4’s, a hammer and nails). A gazebo is another great option for shade and can double as the spot where you place your dining table, or you can use it as an additional seating area. Gazebos are appealing because they are essentially their own rooms, but outside. Both pergolas and gazebos are also great for further accessorizing. Consider hanging a chandelier over your dining space for a more luxurious atmosphere. If you want to keep things simple, think about a cantilever umbrella; you can find these in varying sizes, which is perfect if your backyard is on the smaller side but you still want the option to get away from the sun. While summer days can be painfully warm, summer evenings tend to cool down and bring a breeze. Don’t cut your days short by retreating indoors when the sun goes down, but rather, invest in an outdoor fireplace or pit. Not only will yours be the most stylish backyard in the neighborhood, it is also likely that you will never want to go back inside. A fireplace is perfect for a flare of romantic ambiance, while a pit is fun for families who want to host a s’mores and hotdog style bonfire. Think of your backyard as an extension of the inside of your home. Your house is separated into rooms, so it is smart to create “zones” when drafting the layout of your backyard. These zones should be segregated based on the activities you plan to do in each respective area. Be sure to prioritize the zones that you will utilize on a regular basis. If you plan to host backyard barbecues this summer, you should have a designated dining area with plenty of seating and surfaces for plates and drinks. Do you have a pool? If so, consider creating a “wet zone” where you can have either a shed or some type of storage bin to hold towels, pool toys, etc. If reading the morning paper while drinking a steaming hot cup of coffee is how you plan to spend a majority of your mornings this summer, be sure to put your comfiest furniture, and ideally a small side table, in that zone. If you haven’t already, this summer is THE summer to invest in a barbecue. You have the option of going “all out” with a built in BBQ, but there are plenty of places to purchase a smaller barbeque if you are on a budget but still want to get the job done. If the smell of a hot juicy burger sizzling on a grill isn’t enough to convince you, how about the fact that barbecues are easy to prepare and cook with. If you’re really hungry but don’t want to spend a ton of time prepping an entire meal, fire up the grill and start emptying out the fridge. Barbecues are also a great way to get the family, or the neighborhood, together. No host or hostess wants to be stuck inside while his or her guests are outside enjoying some cocktails and the sunset. The right setup allows you to socialize and be part of the party, while also acting as chef. Nothing is more inviting than a well lit outdoor space, especially around sunset. Give your backyard a touch of ambiance with strategically placed forms of lighting. Consider stringing the likes of Christmas lights across the yard to instantly feel like you’re on a romantic Italian getaway. Invest in several tiki torches and position them in the grass or planter boxes, and your family will believe they are at a Hawaiian luau. If you’re looking for more of a relaxed, spa-like atmosphere, adorn the yard with dozens of twinkling candles. Worried that one night you might forget to blow out that last candle? Purchase ones with a fake flame and an on/off switch. There are versions that are so realistic - the flames even flicker - and no one will ever know. If these reasons weren’t enough to get you excited about prepping your backyard for summer, move to Antarctica. Than Merrill is the CEO of FortuneBuilders and CEO of CT Homes LLC. Lighting and accessories can create the perfect atmosphere with the right planning. We’ve always recommended soapstone to anyone who is renovating an outdoor area. For fireplaces, grill tops, countertops in an outdoor bar, etc. It’s heat/water/temperature proof, so even when it’s unused during the winter, it doesn’t get damaged.